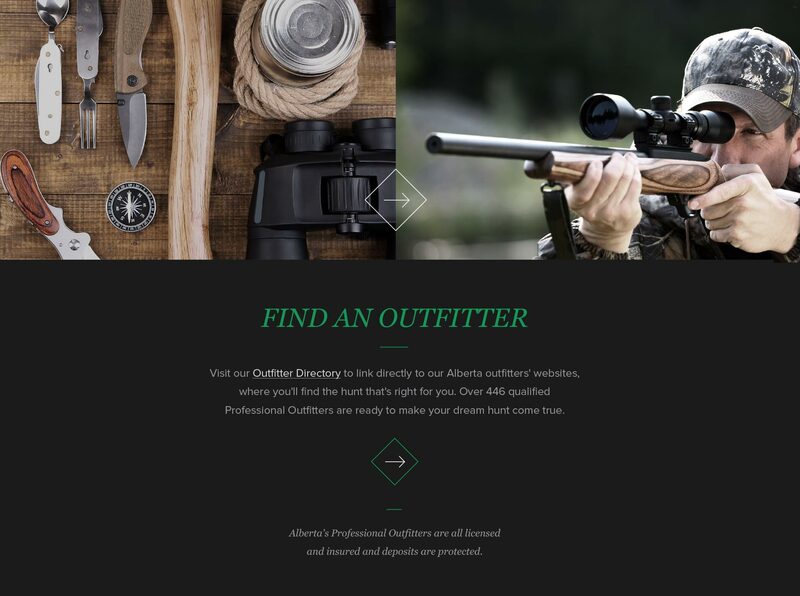 We were approached by the Alberta Professional Outfitters Society to redesign their website. Naturally, we took it one step further. 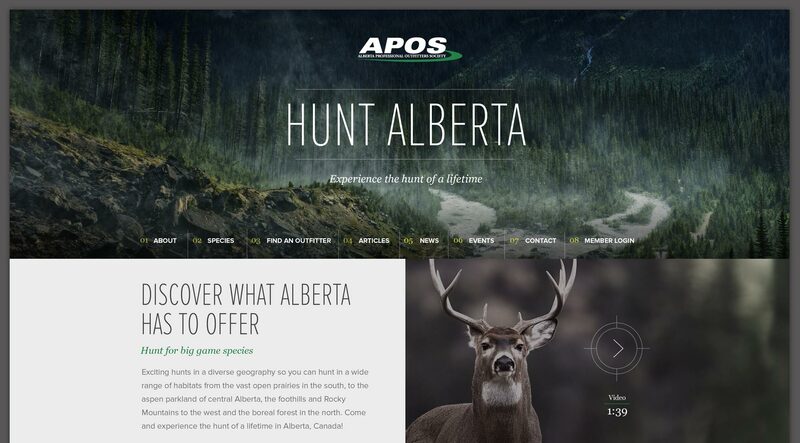 Focusing on travelling hunters, we turned the APOS website into a visual experience showcasing Alberta's majestic landscapes and beautiful species. APOS has over a directory with over 450 member outfitter-guides. Many of these member outfitters are found and hired through the APOS outfitter directory. Our job was to present APOS as the authoritative entity for the outfitted-hunting industry in Alberta. 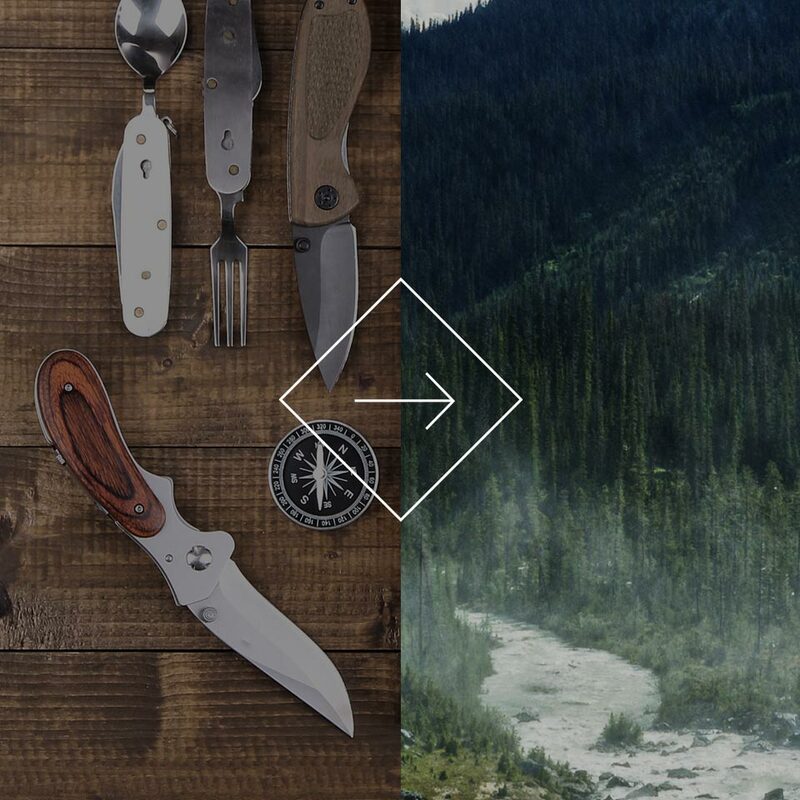 Organized outfitting in Alberta dates back to 1922 with the formation of the Rocky Mountain Outfitters Association. There is a rich history in Alberta that we weave through the design using classic typography and simple angular iconography. We compliment these classic elements with a modern condensed typeface and a strong visual grid. We created a responsive design that keeps the design integrity of the full site. Scroll inside the iPhone to view the responsive design. When you decide to offer a mobile experience to your audience, it's crucial that your visitor can still access the same content. Nothing is worse than a redirect to a "mobile version" with only half the content. Our approach to responsive design is to include every piece of content, headline, and image, styled especially for the screen you are using. Contact us and we’ll get back to you in 1−2 business days. We’d love to hear about your project. Tell us how we can help your business succeed. I'm ready, let's get started. @ignitionind Some of our latest design and print work will be on display at Microsoft's @MS_Ignite at the @modalitysystems booth in Atlanta. @ignitionind @SwiftHostCA Thank you very much! @ignitionind With the launch of our new website in early 2015, we’ll be expanding our services list.